On Wednesday, November 22, 2017, Sun Prairie Police responded to a theft report at Varsity Bar & Grill located at 1205 W Main St in Sun Prairie. 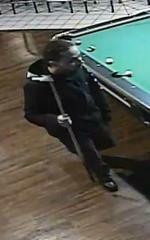 Two unknown subjects stole a green cloth cash bag with an undisclosed amount of cash from the bar at closing time. 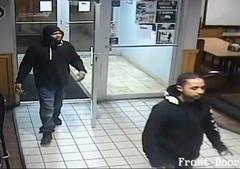 The suspects fled prior to officer arrival. One subject is an Hispanic or light-skinned black male in his 20’s, has “corn-row” braids in his hair, a light beard, and tattoos on his forearms. 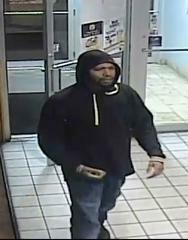 He was wearing a black hoodie with a large, white “2” on the left side of the hood, a large, white “3” on the right side of the hood, and white logos down the left sleeve. The second subject is a black male in his 20’s with a light beard. He was wearing a black hoodie with white strings. Photos are contained in this Release. This investigation is still ongoing. Anyone with information regarding this crime can call the Sun Prairie Police at (608)837-7336 or anonymously at (608)837-6300.